Born Jun 22 19021,6,7,8,9, Randolph County, Indiana1,6,7,8,9 [Richmond, Wayne County, Indiana10]. Louise' obituary was published in "The Xenia Daily Gazette" (Xenia, Ohio) on Monday, February 5, 197311 (see scan below). Leroy's obituary was published in "The Xenia Daily Gazette" (Xenia, Ohio) on Thursday, February 6, 197510 (see scan below). Wilmington, Ohio daily newspaper, Feb 6 1975 and Feb 5 1973. Contribution from Shirley Ann (Hinshaw) Oglesbee citing: birth certificate. Obituary of Leroy Hinshaw; "The Xenia Daily Gazette", Feb 6 1975; http://www.ancestry.com. 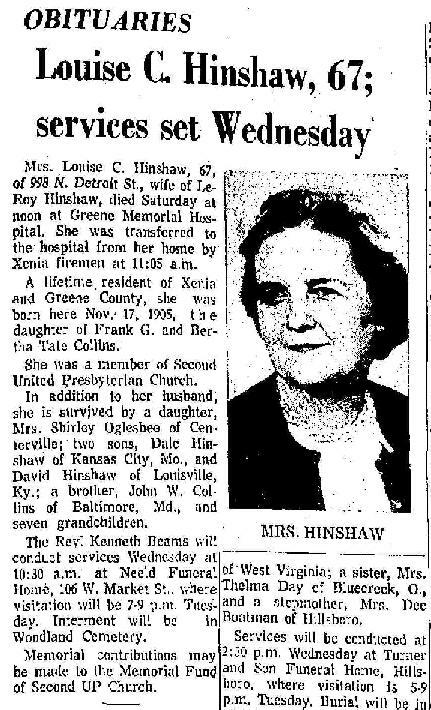 Obituary of Louise Hinshaw; "The Xenia Daily Gazette", Feb 5 1973; http://www.ancestry.com. Contribution from Shirley Ann (Hinshaw) Oglesbee citing: death certificate.